We regret that due to unforeseen circumstances, our event with Douglas has been cancelled and will not be rescheduled. We hope to host him for his next new book. 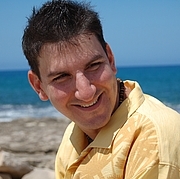 Former New York criminal defense attorney and winner of the 2009 Minotaur Books / Mystery Writers of America First Crime Novel Award, Douglas Corleone traded in his subway pass for tropical island weather when he moved to Hawaii and began using the islands as the backdrop for his Kevin Corvelli mystery series. Good As Gone, his latest novel, is a standalone set in France, and is Doug’s first international thriller. Good As Gone introduces readers to former U.S. Marshal Simon Fisk. Douglas Corleone will discuss and sign his newest Simon Fisk thriller, Good As Gone, on Thursday, September 26th at 7 pm. Haunted by the disappearance of his six year old daughter 6 years ago,former U.S. marshal, Fisk now employs his unorthodox skills recovering kids abducted by noncustodial parents because stranger kidnappings hit too close to home. When six-year-old Lindsay Sorkin, daughter of a cutting-edge weapon designer, disappears from her parents’ hotel room in Paris, Fisk is blackmailed by French police to help locate the missing girl. But Lindsay’s captors did not leave an easy trail, and following it will take Simon across the continent, through the ritziest nightclubs and the seediest back alleys, into a terrifying world of international intrigue and dark corners of his past he’d rather never face again. With lightning-fast pacing and a twist behind every turn, Douglas Corleone's Good As Gone is a gripping race against the clock for a young girl with her life on the line and a man who has nothing left to lose. "Good As Gone is as good as it gets. Simon Fisk is a fascinating character, and Douglas Corleone has crafted one hell of a thriller. It is a pleasure to recommend this nonstop novel to my readers." --Michael Palmer "Good As Gone delivers a lightning-fast pace, surprising and heartfelt twists, and action aplenty.”—Jeff Abbott "A terrific international thriller. I expected to be entertained when I picked up a novel by Douglas Corleone and was rewarded handsomely. Highly recommended." --James Grippando Douglas Corleone is the author of One Man's Paradise, his debut novel that was a finalist for the 2010 Shamus Award for Best First Novel and winner of the Minotaur Books/Mystery Writers of America First Crime Novel Award. A former New York City criminal defense attorney, Douglas Corleone now resides in the Hawaiian Islands where he is at work on his next novel. Douglas Corleone is currently considered a "single author." If one or more works are by a distinct, homonymous authors, go ahead and split the author. Douglas Corleone is composed of 1 name.